Home › Mystery › Top 10 Mysteries of 2017? Top 10 Mysteries of 2017? As 2017 comes to a close, let’s take a moment to look back at the year’s most popular mysteries. Based on circulation figures at the library where I work, these were the most checked out mysteries in 2017. Considering last year’s list, it’s surprising that this year’s list was more varied. Once again there’s a tie for tenth place! Paws and Effect by Sofie Kelly & Death of an Avid Reader by Frances Brody — In the 8th Magical Cats series title, librarian Kathleen Paulson and her feline partners investigate a murder at a reunion to find out who is framing Kathleen’s beau, Detective Marcus Gordon. In the intricately plotted Death of an Avid Reader (6th in a series), Kate Shackleton searches for a long lost child and investigates the death of a mathematician whose body was found in the basement of a library along with the prime suspect, an organ grinder and his Capuchin monkey. Crowned and Dangerous by Rhys Bowen—In her 10th adventure, Lady Georgiana Rannoch (35th in line to the British crown) heads for Ireland to prove the innocence of her future father-in-law who has been arrested for the murder of a wealthy American. Glow of Death by Jane K. Cleland—In the 11th book in the Josie Prescott Antiques Mystery series, Josie appraises a genuine Tiffany lamp belonging to Edwin and Ava Belcher. But everything Josie knew about the Belchers and the lamp is turned on its head when “the woman she knew as Ava” turns up dead. Two Nights by Kathy Reichs— In this standalone thriller, Sunday “Sunnie” Night searches for a girl who has gone missing in the wake of a bomb explosion. Along the way, she must face the psychological trauma of her own past. The Burial Hour by Jeffrey Deaver—Lives literally “hang in the balance” as Lincoln Rhyme pieces together the puzzling clues to track a killer known as the Composer, who kidnaps a businessman in broad daylight and records the man’s slow hanging against a musical backdrop. Pekoe Most Poison by Laura Childs—Doreen Briggs’ husband drops dead at a “Rat Tea,” where “servers dressed in rodent costumes and wearing white gloves offer elegant finger sandwiches and fine teas.” It’s up to Theo to review the guest list and find the killer in this long-running series. Chaos by Patricia Cornwell—In the 25th volume of the series, Dr. Kay Scarpetta fears Tailend Charlie has returned to target her and her loved ones when a young woman is killed while riding her bike along the Charles River. Read my review (Part I and Part II) for more details. Turbo Twenty-Three by Janet Evanovich—A bounty case leads Stephanie to an ice cream factory where one of the workers ended up frozen dead on trailer truck. 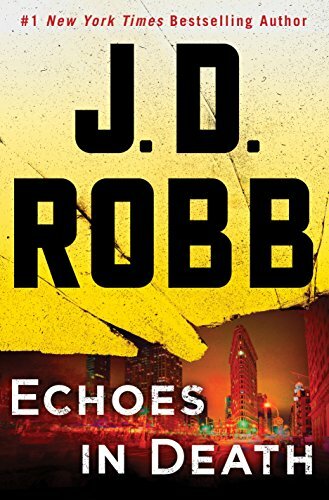 Echoes in Death by J. D. Robb aka Nora Roberts — Eve Dallas has edged out Stephanie Plum for the most read mystery of 2017. It’s the 44th book in the series, and Eve and her husband Roarke encounter a dazed, naked, and bloody young woman in the road. Her husband is dead amid the wreckage of their ransacked town house. The victim had no shortage of enemies, but which of them did it? And there you have it, the most popular reads of 2017. I’m actually shocked someone managed to dethrone Janet Evanovich from the number one slot. Her Stephanie Plum series had snagged the number one most read title for the last two years. Last year, I predicted Evanovich’s Turbo Twenty-Three, Cornwell’s Chaos, and P.D. James’ The Mistletoe Murder (all published in the final months of 2016) to appear on 2017’s list. We’ll I got two out of three on that. The Mistletoe Murder didn’t rank, but the other two did. And as usual, several books in the top ten were actually published late in 2016, but continued to be popular in 2017. So are you delighted or disappointed by the top reads of 2017? How many have you read? Which books would make your 2017 top ten list? What are your speculations for 2018 and mystery reading resolutions for the new year? Where’s the New Year cocktail??? If all goes well, the first cocktail of 2018 should appear this Friday. Thank you Brian! I’m reading The Ghost of Christmas Past by Rhys Bowen and enjoying it. This is a great list. Take care. Best wishes for the New Year 2018!